The older I get, the more I appreciate gathering around the table. Being generous with my space and attention, and letting others do the same. The clink of glasses and chatter across the room. Candles burning down as the evening stretches on. Dinner almost always served late. Entertaining, at least in the traditional dinner party sense, in the cramped confines of city spaces is no easy feat. I'm lucky to have an apartment that allows for a dining table that seats more than four people (my current record is 16) and I try to host on a semi-regular basis. With food allergies, I often feel more comfortable hosting since I get to control the meal and food prep. I like cheese and charcuterie boards because of the forced sharing. They’re intimate. Maneuvering elbows and utensils around wine glasses and other guests. An invitation to settle in and take your time. And they work no matter the space available, no matter the type of event. I’m quite sure there are more expert tips than these, however if you are very new to this art of the shared board, my hope is to give you a great place to start. I’ve eaten a lot of cheese and cured meat and, for lack of a better term, have studied what I like and don’t like about combinations for future use. The biggest thing I like to play with is texture. If you remember nothing else, look for products with different textures, or think about how you can incorporate more than one texture into the board. Everything that I purchased for this board came from my local grocery store. Unless this is something that you really want to go all out for, I don't think it's necessary to travel to multiple shops to find the ingredients. On this board, I went with two hard cheeses and two soft cheeses, originally. The friends I had for dinner on this particular evening had just returned from Lithuania and brought with them a gorgeous hard cheese to add to the mix. These cheeses don't have particularly strong flavours (like, say, a blue cheese would) and are nice if you're not sure how adventurous of a palate your guests have. Also, if you do like to make a lot of cheese plates, cheese freezes really well. Buy a bunch for your event, pop the leftovers in the freezer and they're ready for your next get together or unexpected guest. From left to right: aged cheddar, camembert, brie, Lithuanian cheese whose package I did not save, parmesan. 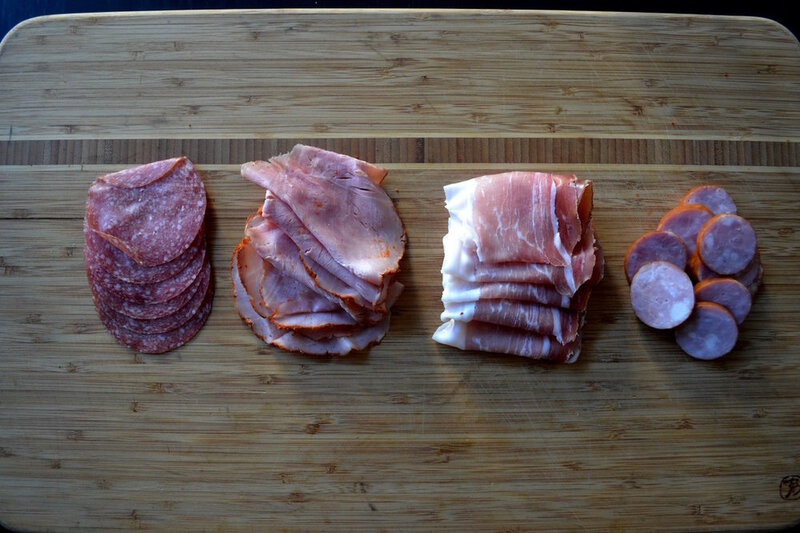 I like to stick with pretty classic choices for charcuterie, mainly because something different or extravagant is difficult to find and can be pricey. That being said, I've never had any complaints with the four choices I've listed below. There is enough of a differentiation between textures and flavours that makes for some fun combinations with the cheese and condiments. I always like to make sure I'm adding some flavours and textures that I won't be able to achieve with the cheese and charcuterie. The olives and grainy dijon mustard provide a salty, brine-y and vinegar-y flavour. The pears, strawberries and marmalade add the sweetness. As I'm allergic to nuts, that is something I obviously don't put on the plate and something I've done little research on. If that's not a dietary restriction, absolutely add one or more kinds of nuts for added crunch and depth. I will often add pumpkin or sunflower seeds to mimic that nutty flavour. Both of the crackers I used on the board are gluten free, and are a nice for added crunch. I will often have bread available as well, as that's easy to get for guests who eat gluten and guests who don't. What does your favourite cheese and charcuterie board look like? I'd love to hear about it!